On this page are a couple of newspaper clippings, one of which mentions Thomas Selby. Again, the handwritten caption under the photo says "Porter sunk June 10, 1945." 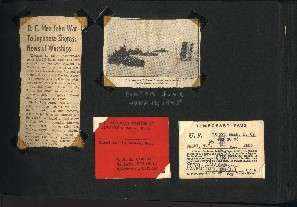 Also on this page are a chow card and temporary pass for the Navy Yard in Washington, DC.